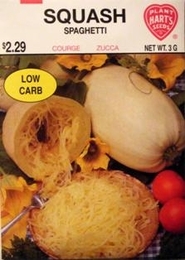 A unique squash with delicious, spaghetti like interior. Harvest when ripe, boil whole for 30 minutes, cut in two, and scoop out the spaghetti. Allow the fruits to remain on the vine until fully matured. Protect the small plants from insects, water as needed, and keep vines picked clean.